Throughout the transit process Rachel, one of their regular keepers from Port Lympne, tends to the boys, providing food, water and the reassurance of her familiar presence. After an uneventful road trip our valuable cargo is loaded onto a plane at Luxembourg Airport for the start of the airborne stage of their journey. It is a long and tiring process for the four brothers, but they cope well with the confinement. Whilst we have experience of animal transports of this type we never underestimate the complexity so everyone is relieved when all arrive safely at Brazzaville airport in the Republic of Congo. The travel crates are strapped securely onto 4x4 trucks, the rugged vehicles essential to cope with the pot-holed roads that they will travel along for the 4 hour journey to our camp. By the time they arrive it is dark, and so they rest for one more night until early the following morning they are taken by boat along the Louna river, one by one, to the release site. The boys will initially live on a 34 acre island on the edge of the Lesio Louna Reserve. Bordered partly by an ox bow bend in the river, the remaining boundary has been secured with electric fencing. Inevitably cuts and scrapes will occur, not necessarily caused by the gorillas interacting with each other, but also as they get to understand their surroundings. Healthy gorillas heal well and our team in Congo will only intervene if it is considered essential to the animal's well-being. With that in mind, and as it is such a large island, thought was given to how the rangers might tend to a sick gorilla. Whilst it is hoped it won't be needed, a small shut-off area was created that will allow an animal to be observed and treated effectively. Everything is ready and waiting by the time the boys arrive. The island contains substantial quantities of natural food, but the gorillas need time to learn how to feed naturally so they are given additional fruits and prepared feed. A good body weight is very important in maintaining the overall health of the gorillas. Inevitably the journey to Congo, and the first few months post release, are quite stressful and a time when they can drop weight quickly. With six camera traps on the island, and our rangers taking observations and photos at least twice a day, the boys are being closely monitored. 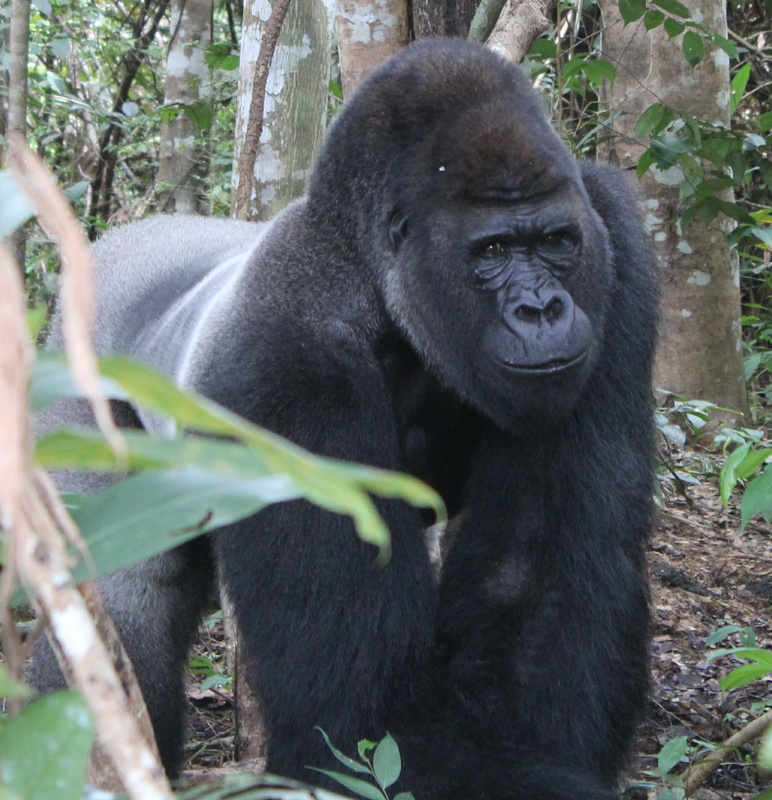 We regularly body condition score gorillas after they first return to the wild. This is an objective way of monitoring their muscle development and fat stores using numbers. It is important that we have a set way of looking at them and monitoring them that is not subjective- i.e. using numbers rather than thinking ‘that one looks a bit thin’ or ‘that one looks a bit fat around the belly’. We use the regular scores to help monitor how well the gorillas are doing, and can make changes to their care as appropriate. Information passes all the time between Congo and our overseas and veterinary experts in the UK, together with side profile photos, as part of our ongoing management. There is no set timetable for our ultimate goal of releasing the boys to live free in the Lesio Louna Reserve. Progress will be made at the speed set by the gorillas themselves. Already we have reached the end of the first year and have seen changes in the dynamics of the group. Some of the boys appear to be adjusting at a faster rate than others. This is to be expected and serves to highlight the complexity of animal reintroduction, especially with such a highly intelligent species. Over time it will be possible to reduce their supplementary feed both in volume and frequency and, when they are ready, the four brothers will take their final step back to the wild. They have a lot to learn, and we should not fail to appreciate the physical, mental and emotional adjustments captive bred animals face when repatriated. But the ultimate goal for these four silverback gorillas is priceless - the life they deserve - in freedom, with every possibility of siring a generation born in the wild. In that regard, this is only the beginning of their story.